Now that you have been diagnosed with a cataract and you have decided to have surgery, you will need to have a few measurements taken of your eye to measure the curvature of your cornea and the size and shape of your eye. These measurements help the doctor choose the right type of implant for you. You will also be given a prescription for eye drops to be used prior to your surgery and paperwork that you will need to fill out and bring to the hospital with you. There will also be an information pamphlet with all of your instructions. 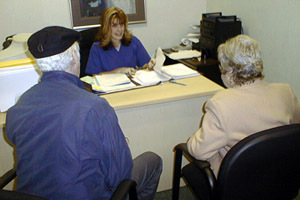 Your surgery will be done at the hospital and you will be given the exact time you need to check into the Admitting Department. DO NOT EAT OR DRINK ANYTHING AFTER MIDNIGHT THE NIGHT BEFORE SURGERY. Including water. You should continue to take all medications for blood pressure, heart problems, asthma and epilepsy, with sips of water up to 2 hours prior to surgery. DO NOT TAKE DIABETIC MEDS (Insulin or tablets) & DIURETICS (Fluid Pill). Please bring your daily medications with you (in their original containers) on the day of your surgery. Leave all jewelry and large sums of money at home. Bring only cab fare if necessary. The hospital assumes no responsibility in case of loss. You will be asked to remove all make-up and hair ornaments. Please remember to bring your contact lens container. Rings that cannot be removed will be secured with tape. An intravenous may be started before your procedure. You are NOT TO DRIVE after receiving an anesthetic or sedation. You must arrange for a responsible adult to drive you to and from the hospital or have fare for a cab. You must not operate hazardous machinery (including driving a car) or sign important documents for the remainder of the day. Wear loose comfortable clothing. (i.e. jogging suit). After your surgery, you will return to the hospital recovery area for a short time. You will be given something to eat and drink. The nurse will give you an appointment to see the doctor the next day and instructions for that evening.